"These are a delicious treat for the holidays, after a day the juice from the strawberry gets absorbed by the cupcake. Yummy!" Preheat oven to 350 degrees F (175 degrees C). Grease mini muffin cups or line with paper liners. Mix pastry flour, white sugar, and cocoa powder together in a bowl; add water, oil, and vanilla extract and blend until batter is smooth. Spoon batter into the prepared muffin cups. Bake in the preheated oven until a toothpick inserted in the center comes out clean, 8 to 12 minutes. Cool in the tin for 5 minutes. 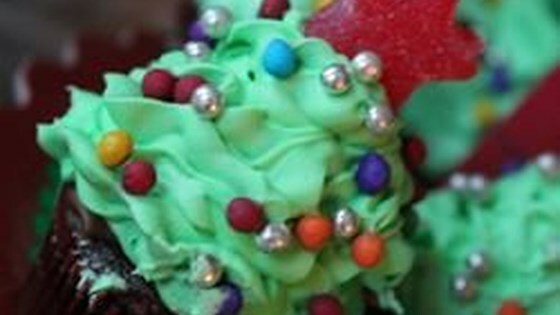 Mix frosting and green food coloring together in a bowl until evenly combined. Transfer frosting to a pipe bag or plastic bag with a snipped corner; refrigerate for 5 minutes. Squeeze a small amount of frosting onto the hulled side of each strawberry and place each onto a cupcake so the strawberry is in the shape of a tree. Pipe frosting onto each strawberry to look like leaves. Add candies to the "tree" to look like ornaments and place a star-shaped candy on top of each "tree".